This tool allows the placement of windows into walls. To place a window first set its properties at the bottom of the screen, then tap the containing wall in the desired position. After placing a window it can only be moved within the wall. Before an exact measurement you can change its position by activating the window tool, and tap the window. Now swiping your finger you can move the window to another position. You can also resize it by activating the move corner function from the drawing toolbar tapping one endpoint of the window and swiping your finger alongside the wall. Please watch our related video. For moving it to its accurate position, use the survey tool. To adjust the placement of a window, choose one of the window’s corners then survey its distance from another corner of your drawing. The most accurate measurement can be achieved if you can measure it from one of the corners of its containing wall. To measure the width of a window simply select its two endings using the survey tool, and enter the measured distance. The changes will be reflected instantly on the floor plan. 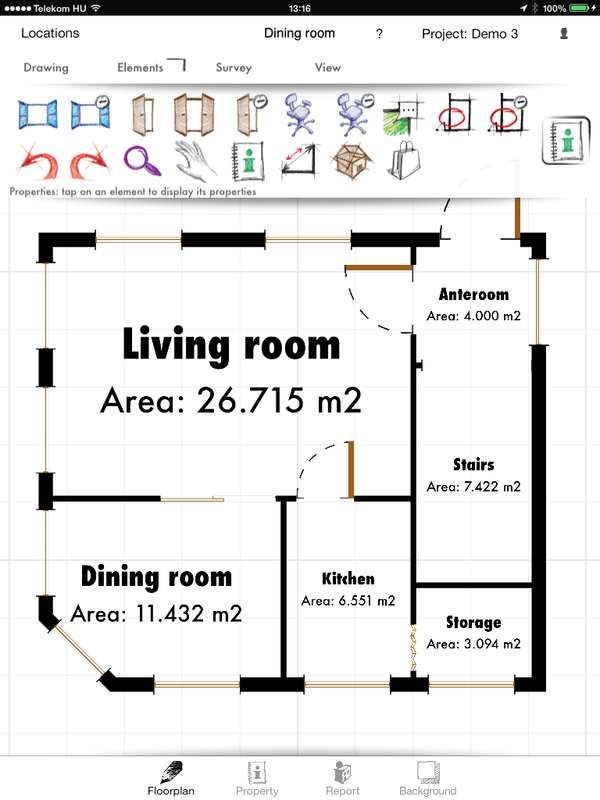 You can open its property sheet, and enter the width to the width field, and you can also modify the major properties of the wall openings in the pop-up toolbar at the bottom of the screen. Also here in the property sheet can you customize it. Editing the property sheet you can select between simple casement, you have double, hooper and fixed window, all in wood and plastic material. To delete a window from the floor plan simply tap it, and it will be removed. For moving it to its accurate position, use the survey tool. To do it choose one of the doorâ€™s corners and then survey its distance from another corner of your drawing. The most accurate measurement can be achieved if you can measure from one of the corners of its the containing wall. To delete a door from the floor plan – let it be a one or two winged door – simply tap it, and it will be instantly removed. To place an object the first and most important thing is to prepare its properties at the appearing settings bar at the bottom of the screen. There you can set its dimensions as well as you can choose its object type. When you have set the required object type and its properties, then tap its location on the floor plan. As the object appears you can tap and hold to move it, or rotate it using two fingers (keeping their distance unchanged) as you would move or rotate a peace of paper above the floor plan. When you tap the screen at a different location, where there is no current object placed, then a new object of the current type will be placed down. To delete an object simply tap it on the screen. With this tool you can add annotations by freehand drawing. Choose the thickness and the color of the pencil and simply draw on the floor plan. Feel free to use this tool because in view mood you can hide all you annotations with a click. With this tool you can delete your freehand drawings. When this tool is active, you can draw a thin grey line on the screen and if this line crosses a previously created annotation line, after releasing the screen both will be removed.